Steve, Aimee and Daniel collectively have over 30 years of teaching experience. All three of these premier Structural Integration teachers did their formal training and teaching with schools certified by Hellerwork International. They are very excited to have joined together to create the curriculum and program for the New School of Structural Integration. With Steve Bulger as your teacher, you will enjoy a comprehensive educational experience that makes learning interactive, relaxed and fun! Steve is an enthusiastic, humorous, compassionate practitioner and teacher of the healing arts. He conveys clarity and presence in private sessions and the classroom which emanate from his spiritual nature. Since 1985, Steve has been practicing, teaching and appreciating the healing arts. He is a graduate of the International Professional School of Bodywork’s 1000 hour training program. In 1990, Steve received his certification in Hellerwork Structural Integration upon completion of the Hellerwork Practitioner Training Program. He was a Senior Faculty with Hellerwork International, LLC where he also served as an originating member of the Board of Education. Currently, Steve is a founding member, the Director of Education, and Senior Faculty with the New School of Structural Integration in Laguna Beach. Aimee Kolsby is a Board Certified Structural Integration practitioner. In addition to having a successful private practice in New York City and Laguna Beach, California since 1999, she is on the Faculty of the New School of Structural Integration. Further driven by her interest in biomechanics and the visceral causes of structural mis-alignments, Aimee studied extensively, mentored with, and assisted Liz Gaggini from 2003 - 2009, premiere advanced Structural Integration teacher and founder of Biomechanics of Alignment and Visceral Core Integration. Aimee’s background in art history and the study of vintage anatomy at New York University is evident as she brings her love of detail and beauty to the interactive audio visual teaching aids and booklets that NEWSSI is well-known for. Aimee is pleased to bring her expertise and experience to Laguna Beach as she fulfills her love of teaching, passion for the work and her desire to build a thriving community of Structural Integration practitioners. Dan Rawson, the Director of the New School of Structural Integration, located in Laguna Beach, California, has been educating others in the art and science of Structural Integration for over ten years. Dan’s personal experience in his private practice dates back to 1992, when he was first introduced to the classic Ten Series of Dr. Ida Rolf. After building a strong foundation in Dr. Rolf’s fundamental teachings, Dan began to look for ways to expand the work, to deepen its affects and bring this classic modality into a place where it could best serve the modern marketplace. To achieve this, he began a long study of Biomechanics, or how the body moves 3-dimensionally through space. This led to more advanced studies into the amazing power of the brain to change itself to enhance physical, cognitive, emotional and creative performance. 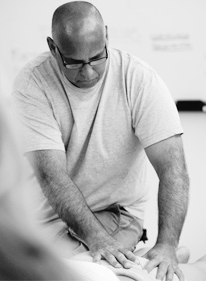 Whether working with a newborn infant or a geriatric client or a professional athlete or weekend warrior, Dan Rawson’s passion to help transform others’ lives through the Ten Series of Structural Integration has never ceased. His passion grows, his enthusiasm grows and the excitement which he brings to teaching continues to inspire others through out the Orange County and International communities.